Good morning folks......IT CHRISTMAS EVE!!!!!!!! 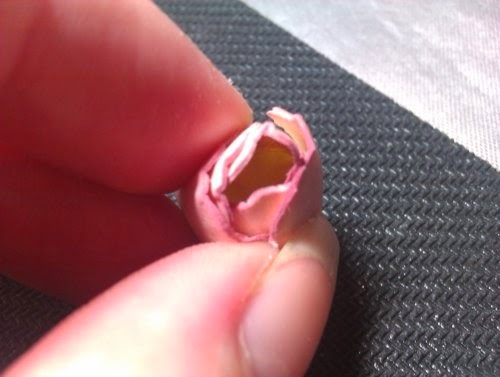 AHHHHHHHHH!!! SANTA IS COMING! Dont you just love Christmas? And once the big day comes and youve torn open your presents, set up the kids new toys and added batteries into everything, eaten until you have to undo the top button of your trousers and you proclaim "I will never eat like that again" even though you cant help but nibble at the left over turkey every time you walk passed it.....you'll think to yourself "Ack well, all the stress, expense and hassle was worth it", lol. I love Christmas, I cant wait to sit around the table with all 18 of us (this year is a light year!!). Anyway, enough of my waffling ("As if" I hear you cry! 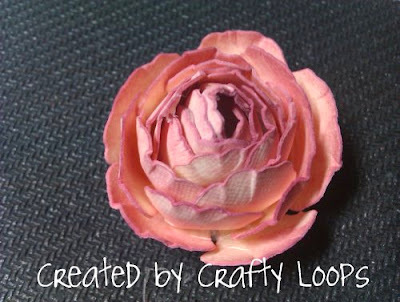 ), I promised I would do the tutorial of this rose. I did say it would be done after Christmas, but what they hey. I may as well stick it up now. Ive decided to call it the Peace Rose as the very lovely and talented Ruth, and of course not forgetting to mention she is a fellow Northern Irelander....Wooowhoooo! (a passion for cards) told me it looked like the Peace Rose her Daddy used to grow so I thought that was a very fitting name. 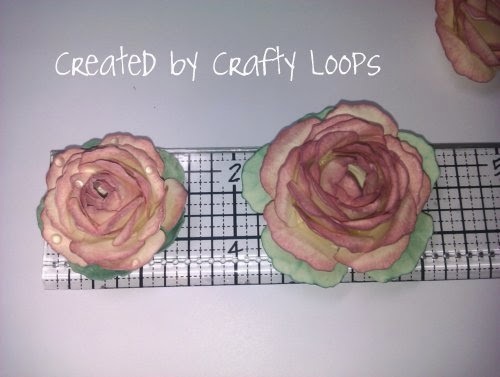 So I have named it the Peace Rose......providing Ruth doesnt mind of course?! Right....on to the tutorial. 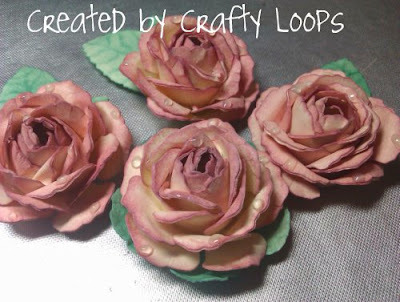 Honestly, its pretty much the same as my wee roses tutorial, Im just using a different flower. I die cut 5 flowers from the Spellbinders Rose Creations Dies. This is the middle sized flower. You also need a large embossing tool (or rounded pen end), hot glue (much better than wet glue in my opinion), cardstock (I used 300gsm cream linen cardstock....Ive just used the end of it, I need to find more! 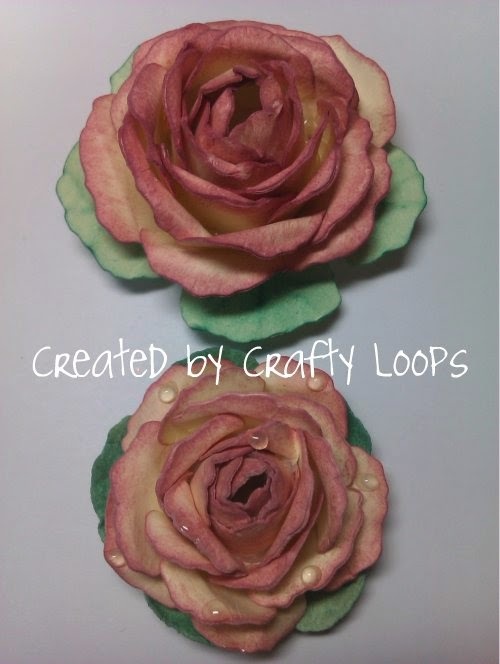 ), Distress inks to colour the petals, glossy accents if you want to add "raindrops" to your petals. 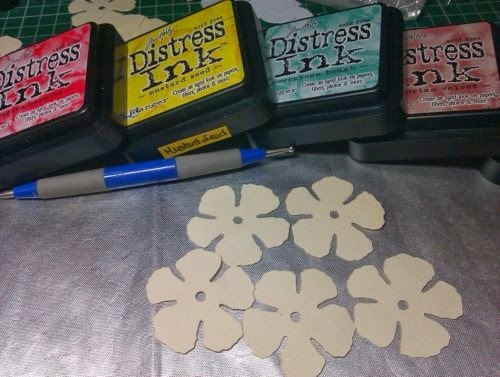 Using Victorian Velvet Distress inks I went around the edges and slightly into the petals on both sides of each flower. 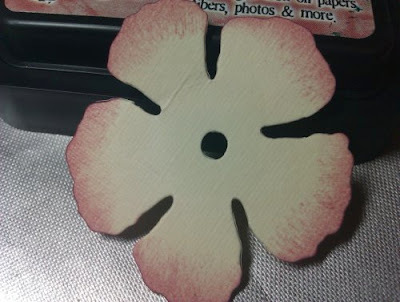 Use a large embossing tool or if you unfortunately dont have a large embossing tool, like me, use the rounded end of a pen and emboss the flower petals in a circular motion. 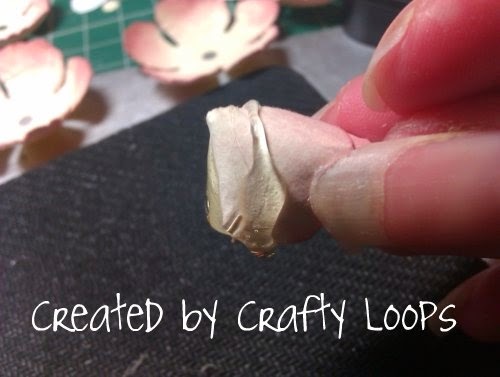 This breaks the fibres in the papers and makes them easier to manipulate into shape. Take one flower and work it into a rose bud shape. 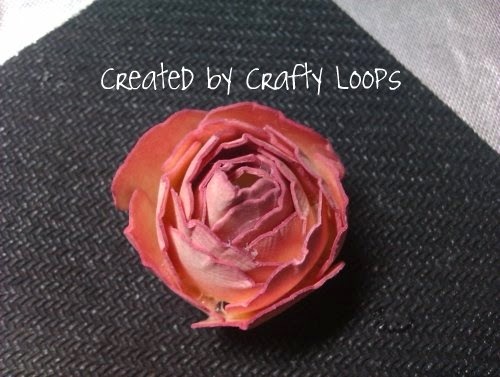 Once you are happy with how your bud will look, open up the bud again and use hot glue on each of the petals, paying particular attention to the edges of the petals. I put the glue near the middle so none of the glue will show anywhere near the top of the bud. (Please excuse my gluey mat!) As hot glue dries quickly, you need to be quick and work your flower back into the rose bud shape. 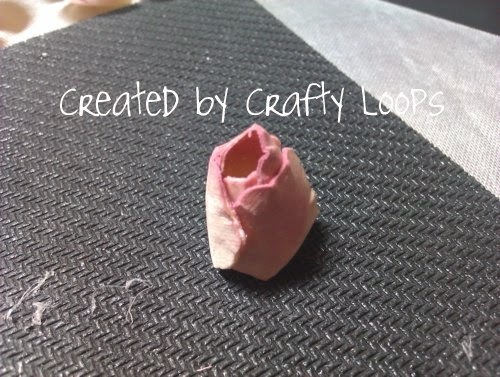 It wont be hard to do as you had previously worked it into shape. 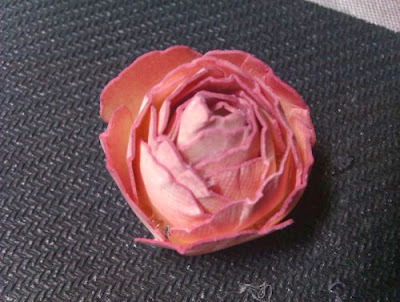 Take your rose bud, put a dollop of hot glue on the underside of the bud and a circle of glue half way up the bud. 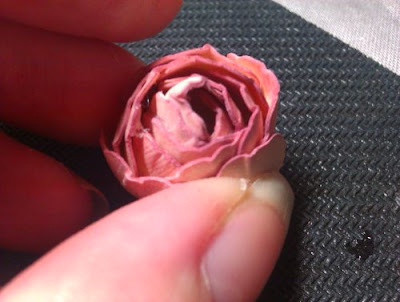 Place the bud into the centre of the next flower and mould the next flower around the rose bud. Try and off set the petals as you place each layer on top of each other. With your next layer, again place glue on the underside of the layer youve just made but this time put a ring of glue just below half way up the flower. 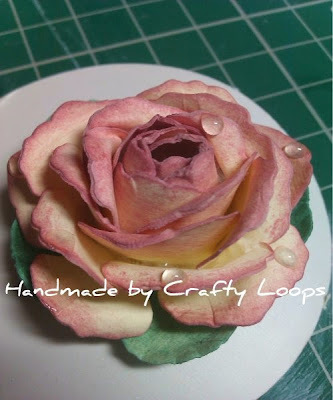 Again place the flower into the next layer and mould it around the forming flower. 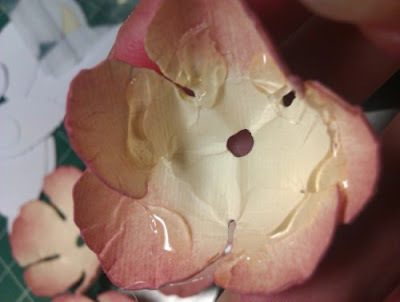 You will see that because you havent put the glue half way up this time that these petals flair out a bit more. This is completely correct. 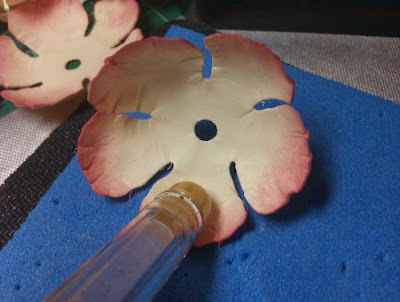 For the next 2 layers do exactly the same, but again place a dollop of glue to the underside and for the last 2 layers simply place a circle of glue around the sides of the bottom of the flower and again mould each layer to the one above it. Again making sure you off set the petals. Once all 5 layers are glued on top of one another, your flower will look like this. 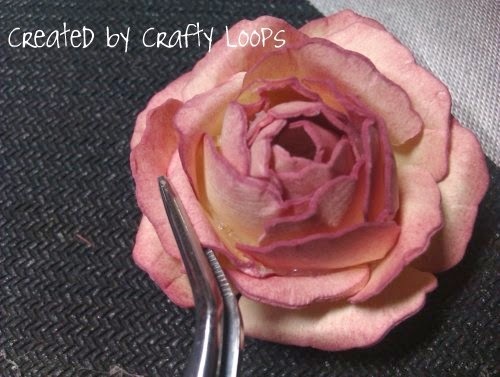 You then need to go around the flower, curling down the outer flower petals to give your rose its beautiful form. I just use my tweezers and curl the edges around them. And that it folks....simple as. 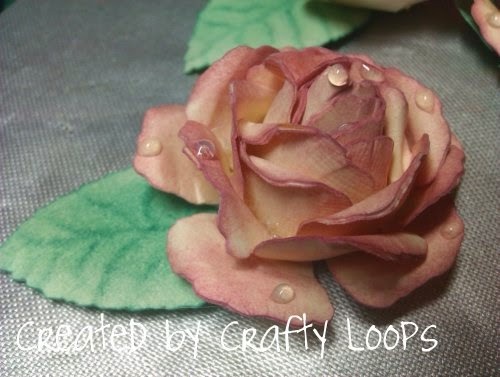 I added some glossy accents on the petals to look like raindrops. On this flower I used the leaves from the die and I embossed my own leaf veins onto them to make them look more realistic. 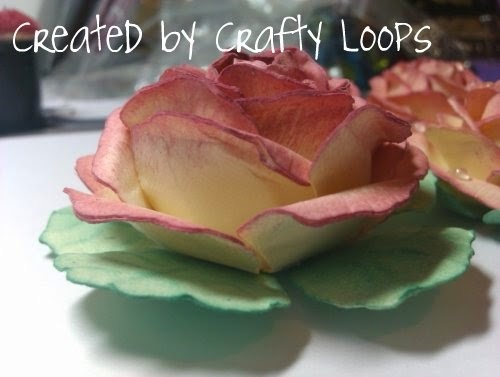 I just used my thin tip embossing tool to do this. And there we have it, my tutorial for my Peace Roses. See it actually is really simple. As always, any questions please comment below or contact me through my email above. I just want to take this opportunity to wish everyone a Wonderful and Happy Christmas for tomorrow and the rest of the Christmas Season. Its my 6 months Blogaversary tomorrow! Yeah! And on that note, if you havent seen my Blog Candy and you are one of the 301 followers I had, please scroll down to enter. Hope everyone has a safe and happy time this Christmas and that 2012 will bring much fun, laughter and fantastically crafty adventures. Have a Blessed Christmas with family and friends!! Just found your wonderful blog, through a few mutual blogging pals, and Wow!! What a wonderful blog you have too, I love it! I adore your flowers, clever you! Thank you so much for sharing. Have now become a follower, so look forward to seeing more. Великолепные розы ! восторг !! STUNNING!!!!!!!!! A fabulous tutorial, thank you so much and Merry Christmas to you too. Hi Lee, these are absolutely fantastic!!! They look amazing with the raindrops! Thanks so much for the tutorial. I'm so touched that you called them Peace roses! I've just been sitting thinking about how much I miss my dad especially at this time of years (even though he passed away when I was 12) so your post has just brought tears to my eyes. I hope you and your family have the lovliest Christmas ever!! And a very Happy New Year. I'm just setting off to join the last-minute shoppers in Belfast......it may be some time before I return! So beautiful Lee..... thank you so much for this tutorial! I can't wait to have a go! Absolutely gorgeous, love the raindrops on them, just stunning Lee..Have a wonderful Christmas. oh wow Lee, these are gorgeous! i love the dew drops on the petals. thanks for the lovely clear tutorial. absolutely stunning they look so real, Have a fantastic day tomorrow hope Santa brings you loads and a Happy new Year. Merry Christmas to you and all yours , honey! 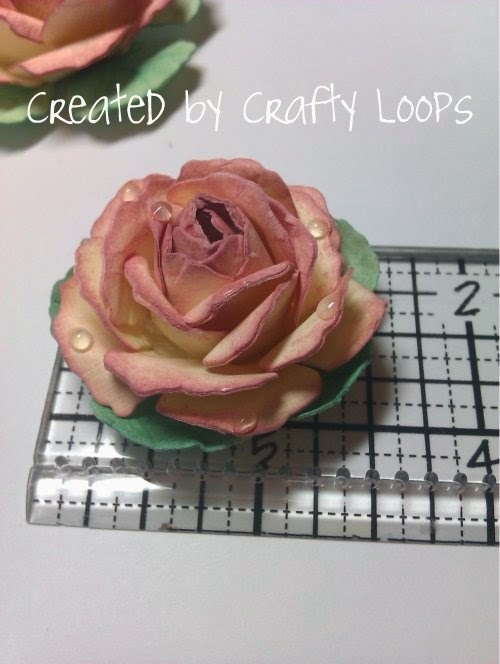 Fab flower and tutorial! Wow this is gorgeous Lee! Thank you for the tutorial. Absolutely stunning roses. Thanks for a fabulous pictorial. Hope you had a Merry Christmas. Lee: I can't believe how BEAUTIFUL your flowers are! They always turn out amazing, and these are SUPER. Thanks for sharing your techniques. It's always inspiring and I should give it a try. Thanks also for the Christmas wishes. We had a quiet Christmas at home (just the 5 of us). I missed my Mom a lot though. She is in Minnesota. I appreciate your thoughts. Glad you enjoyed your extended family. Chat with you soon! These came out SO beautiful. You did a wonderful job with them. I LOVE the finished look :) Hope you're enjoying ing the holidays! I love this flower, thank you. Oh Lee they are stunning, you always make such beautiful flowers. Fantastyczne!!!!! Na pewno skorzystam, a już teraz dziękuję i życzę dobrego Nowego 2012 Roku!!! 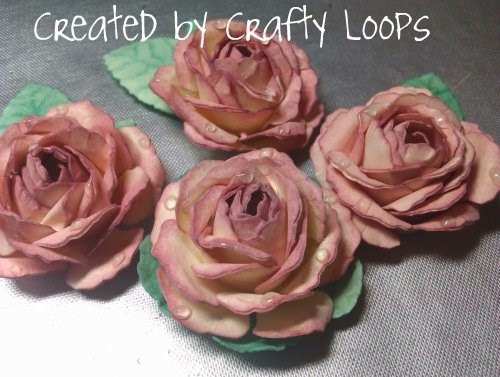 Another fantastic tutorial lee, these are just gorgeous! These are absolutely STUNNING Lee! You are so talented! I keep trying to create paper flowers but they never quite turn out. Beautiful!! 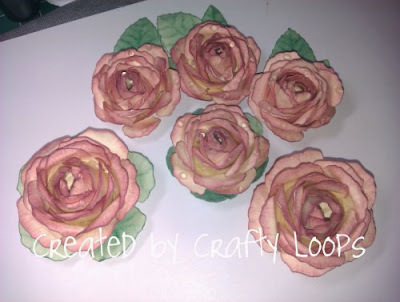 Lovely roses...I must try to create a flower like this by myself! I am just loving this blog!!! 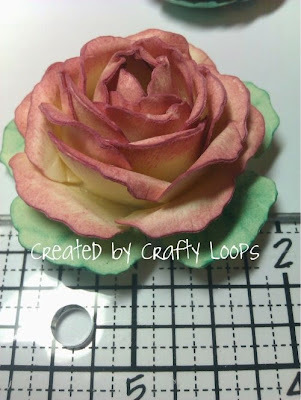 i have come across this blog via coops cluttered corner and it is great, i can only do 1 flower and cannot wait to look at the rest of your tutorials, do you have a tutorial for using distress inks as your rose petals look so realistic, i dont seem to get the hang of distress inks! Holy moly, you are good at those beautiful roses! Beautiful rose, love the raindrops. 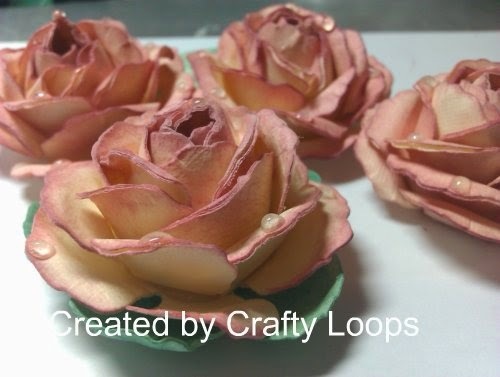 Love all your flower tutorials. Fabulous tutorial!These roses are stunning!I found your blog when I was googling The Rose Creation die and have enjoyed visiting your blog. Stickpins, Flowers and Ghouls.....Oh My! !